The Registrar General and staff at the Civil Registry and Passport Office have been commended by Deputy Governor Mrs. V. Inez Archibald, CBE for their excellent job over the years as one of the few Government departments which handle sensitive documents. The Deputy Governor while addressing a Thanksgiving Recognition Breakfast Thursday morning as part of the office’s 10th anniversary celebrations, congratulated the registrar and staff for their efforts to grow and advance and for using technology to improve the workflow. The Civil Registry and Passport Office also launched its 10th Anniversary magazine and an official copy was presented to Permanent Secretary in the Deputy Governor’s Office, Mr. David Archer. 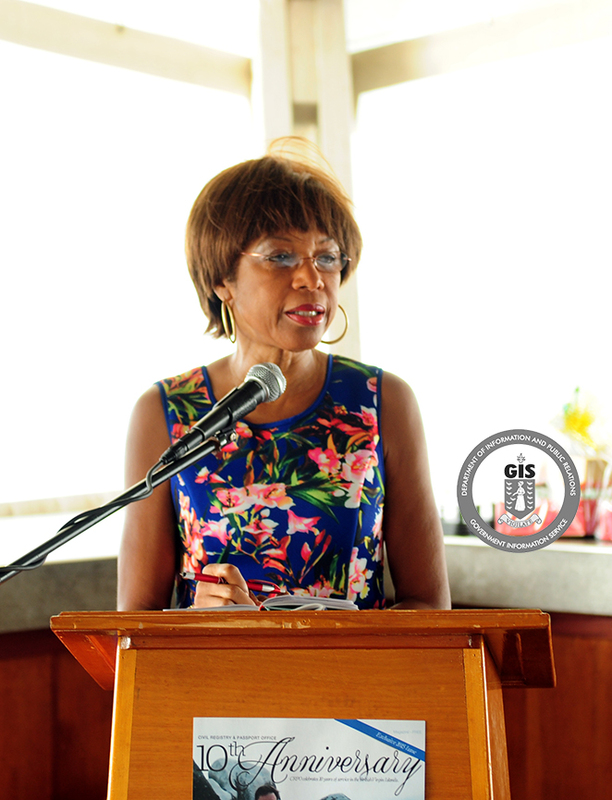 Registrar-General, Mrs. Stephanie Benn stated that the past ten years were very rewarding for the office but moving forward, there are storms on the horizons as it relates to identity theft and terrorism. Mrs. Benn said the time is now to start the conversation for change. Guest speaker, Chief Executive Officer of LGS and Associates, Mrs. Lorna Smith, OBE said the office should be very proud, because the Government’s strategic plan includes the creation of a seamless border control facility. This facility she said would merge the Immigration, Customs and Civil Registry offices and she urged the decision influencers present to press Government to fulfil this commitment. Mrs. Smith also congratulated the Civil Registry and Passport Office on the strides made over the last 10 years and for having available to the public a plethora of printed information on their services. Mrs. Smith stated the office deals with confidence and professionalism all the rights of passage a person will go through in life, from the registration of births and deaths, to owning a passport and getting married. She also congratulated the recipients of the of the Staff Awards and the Registrar-General Award stating they embody the three P’s in Public Service which are passion, preparedness and perseverance. Staff members were rewarded for their exceptional performance over the years. Ms. Karina Del Rosario received the third annual Registrar-General Award and the Elite Team Player Award. Chamanda Smith and Paul Chapman received the good attendance and punctuality awards while Ms. Gipsy Wells-Chichester was awarded for Excellent Customer Service. Several volunteers with the department were also rewarded for their continued support. The celebrations are designed to highlight the series of achievements and success in transforming and reforming the office, since its establishment in 2005. The Civil Registry and Passport Office provides several services to customers including passports, emergency travel documents, citizenship, belonger status, the legaliation of documents, visas, the registration of churches and the registration of births, deaths and marriages. Its mandate is to create and manage the civil records in the Territory and manage all travel documents and nationality matters.